The chance of a newborn sustaining a bone fracture during delivery is relatively low. Studies have shown that approximately one injury occurs for every 1,000 births. This type of birth trauma may the result of a difficult delivery or a it may actually be caused by a doctor during delivery. Unfortunately, fractures are often difficult to detect. Days and weeks may pass before the parents even know something has gone wrong. If you suspect your infant’s bone fracture is the result of medical negligence, it is important to know your rights. Contact the birth injury attorneys at Eisbrouch Marsh to help recover compensation for your infant’s medical expenses and pain and suffering. Birth trauma resulting in a broken bone is most common for mothers who endure a particularly long or hard labor. In situations such as these, it is not uncommon for the delivery room team to resort to special instruments such as forceps or vacuum extraction. The longer the mother and medical team struggle to deliver the baby safely, the greater the odds are that a mistake will occur. The more outside force applied to the fetus, the greater the chances that the baby will sustain a fracture. This type of bone fracture is the most common. An infant with a clavicular fracture will not want to move his arm. The infant will likely cry if lifted under the arm on the affected side, as it is very painful. A chest x-ray can be administered to see if the bone is broken. There is typically no treatment for this condition, as the baby will fully recover within a few weeks. To ease the pain, the parent will need to lift the child gently and may pin the sleeve on the impacted side of the body to his clothes, to immobilize it. A hard lump may be felt where the bone is healing. Many times this is the only indication that the baby had a broken collarbone. There are typically few complications later in life for an infant born with this type of birth injury. It’s important to note that a baby’s reluctance to move an arm may also be caused by nursemaid’s elbow, Erb’s palsy, a broken humerus, or another birth trauma. A long bone fracture in newborns is rare. The upper arm bone (humerus) or upper leg bone (femur) may become twisted and break during a difficult vaginal delivery. The obstetrician may notice or hear the bone snap during delivery or the injury could go undetected until the child shows signs of injury. This injury may be unavoidable, or it can also be the result of a doctor’s error during delivery. Loss of spontaneous arm or leg movement, followed by swelling and pain on passive movement are early indicators that a long bone fracture has occurred. An x-ray of the bone is conducted to determine if it is broken and to rule out septic arthritis, which can present similar early signs. Treatment for a long bone fracture in a newborn is typically placing the injured limb in a sling or cast to keep the baby from moving it around too much. This type of bone injury typically heals quickly, with a recovery in two to four weeks. Future complications are minimal. On rare occasions an infant may suffer epiphyseal displacement. This occurs when the rounded end of long bone in the arm or leg, at its joint with adjacent bones, becomes displaced. This can be diagnosed based on swelling, popping noises, and pain when the bone is moved. The baby will not want to move the bone and will hold it limp by her side. This injury is not visible in x-rays at birth, because the bone is not developed yet. A callus will appear 8 to 10 days after birth, which will appear on an x-ray. Treatment of this injury involves immobilizing the bone for 8 to 10 days. While infant bone fractures can heal properly without incident, this type of birth trauma can inhibit future growth and development. Some children may need a broad range of healthcare and medical equipment to become active. The costs associated with treating a bone fracture can quickly add up, leaving parents with excessive medical bills. 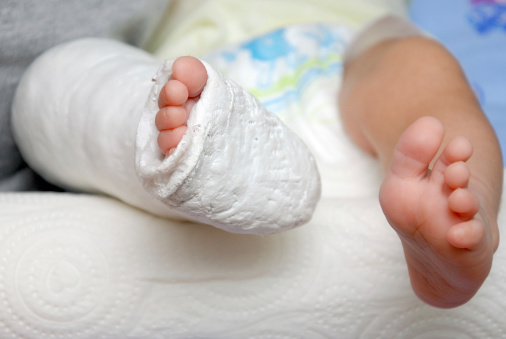 If you suspect your baby’s bone fracture was caused by medical malpractice, the birth trauma lawyers at Eisbrouch Marsh can you determine if a birth injury lawsuit is warranted. Call us today and see how we can help. There is never a fee unless we win your case.